Providing you with years of elegant display, the 70" Full Vision Display Showcase is an easy way for any retailer to create attractive merchandise presentations. 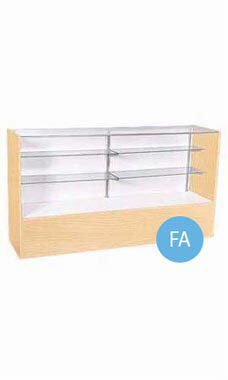 In Maple finish, this display case is fully-assembled. It offers a variety of features, including a low pressure melamine laminate maple finish with a tempered glass top and front. Additionally, these economy display cases features include two rows of adjustable 1/4" split glass shelves 8" and 10" depth, steel interior standards and shelf brackets, to provide a reliable, yet beautiful showcase display. Crating for secure shipping included in the price of the case. Optional lights and locks are sold separately. Available for immediate shipment. Display case came in assembled and didn't have anything broken. It is a well made case. I recommend this case to anyone.